What do you get when you combine water, wind and air with the stockpicker's maxim "buy low and sell high?" By Jack Robertson's reckoning, a viable formula to produce hydrogen energy and green fertilizer. He calls it a hydrogen hub. Scientists often speak of hydrogen as the clean, plentiful energy source of the future, but "it's always been a Buck Rogers, 10-years-from-now concept," says Robertson, 59, a Portland retiree. "We think we've come up with something here that finally cracks the hydrogen code." A hydrogen hub would be a power plant that uses water and air to produce a form of ammonia, then burns the ammonia to yield hydrogen energy. Robertson says his invention would trim the need for gas- and coal-fired power plants that contribute to global warming. He envisions a new sustainable industry springing up at abandoned aluminum plants or the former Trojan nuclear plant in Rainier, Ore.
Robertson is no crackpot. The Stanford University grad worked a decade as an aide to Oregon Senator Mark Hatfield, then 16 years at Bonneville Power Administration, rising to BPA's acting chief executive officer. Robertson has a patent pending for his hydrogen hub concept, and is teaming with technical experts and utilities to move into the testing phase. "There's no rocket science here," says John Holbrook, a Stanford buddy of Robertson's and a retired project manager for the Pacific Northwest National Laboratory in Richland, Wash. Robertson's invention, Holbrook says, is a novel way of putting existing technologies together. "All the pieces have been done before. You only need water, air and electricity to do it." Robertson says it's vital to understand the unique pickle -- and opportunity-- facing area utilities and the BPA, the federal agency in Portland that markets hydro power to Northwest utilities. Every spring, melting snow sends torrents of water past a series of Columbia River Basin dams. The proliferation of wind turbines in the Columbia River Gorge adds to the electricity produced in the spring, when winds pick up. The seasonal surge of hydro and wind power causes the spot price of electricity sold on the wholesale market to plummet. Last spring, Robertson says, some unidentified entities were stuck with surplus electricity and sold it at a loss, to avoid spilling water over the Columbia River dams and imperiling salmon. "They were paying people to take power this last spring," Robertson says, "or were selling it for zero for periods of time." As summer arrives, and people rely on air conditioning, demand for power rises as hydro and wind power production subside. The market price of electricity spikes. "It's feast or famine, because of the way the system is designed," says Robertson. A hydrogen hub would buy up cheap hydro and wind power for several weeks in the spring, say for 1 or 2 cents a kilowatt hour. PGE now sells green power to residential customers for 10 cents a kilowatt hour. The hub would use an electrolyzer to extract hydrogen from water and an air-separation unit to extract nitrogen from the atmosphere. Hydrogen and nitrogen would be synthesized into anhydrous ammonia, using the Haber-Bosch process, named for its inventors. 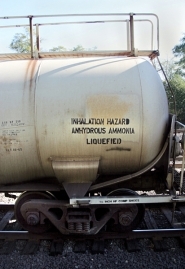 Anhydrous ammonia, a common fertilizer, would be stored in liquid form in tanks. It can be fatal if it leaks into the atmosphere, but it's one of the most commonly shipped chemicals in the world. Ammonia is an efficient way to store hydrogen, says Holbrook, executive director of the nonprofit Ammonia Fuel Network. "We call it the other hydrogen." When the electricity price jumps in the summer, the hydrogen hub runs the ammonia through a generator, producing hydrogen power. Belgium used ammonia to power its buses during World War II. The only byproducts are water vapor and nitrogen, which can be reused or vented into the air. The electricity would free utilities from building extra power plants to meet peak summertime demand for energy. The other 10 months of the year, anhydrous ammonia could be sold to farmers as a form of green fertilizer. The chief barrier to the hydrogen hub concept is not whether it works, Robertson and Holbrook say, but whether it can be done efficiently. Initially, Robertson estimates it will take four to five units of hydro and wind-derived electricity to produce one unit of power from hydrogen. That sounds like a bad deal, unless you can sell the finished product for more than five times the original price. Holbrook also invented a new method, called solid state ammonia synthesis, which holds the promise of being 50 percent more efficient than the electrolyzer and Haber-Bosch processes. Robertson is raising $300,000 to conduct an independent analysis of the untried hydrogen hub concept. Snohomish County Public Utility District in the Puget Sound will back the study and other utilities are considering it. The next step would be erecting a prototype hydrogen hub at an undetermined Northwest site. Robertson estimates that will cost $10 million to $15 million. If it works, the hydrogen hub would produce clean, renewable energy. It would enable the region to tap more renewable hydro and wind power. The price of the hydrogen power will seem a better deal, Robertson says, once the impact of carbon pollution is reflected in the price of coal- and gas-powered electricity. Policies designed to stem climate change also figure to boost demand for fertilizer produced from green power, Robertson says. Every ton of anhydrous ammonia now produced with natural gas energy results in 1.8 tons of carbon dioxide emissions, Holbrook says, and more if coal power is used. Robertson established the nonprofit Northwest Hydrogen Alliance to pursue the project back in 2003. State Rep. Vic Gilliam, R-Silverton, who worked with Robertson on the Hatfield staff, counts himself as a believer. Gilliam is pushing a bill in the Legislature that would let utilities include hydrogen energy among the renewable energy sources they're required to offer customers. He's interested in tapping federal stimulus money to build the prototype plant. Once there's a working prototype, "that's when people will go 'Wow,'" Gilliam says. "I want to show them a hydrogen hub in a year."